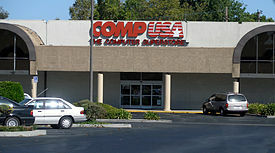 CompUSA was a retailer and reseller of consumer electronics, technology products and computer services. Headquartered in Miami, Florida, it was a wholly owned subsidiary of U.S. Commercial Corp S.A.B. de C.V. and indirectly controlled by a common shareholder, Carlos Slim. On December 7, 2007, an affiliate of the restructuring and disposition firm Gordon Brothers Group, Specialty Equity, bought the company. Systemax purchased the CompUSA brand, 16 retail locations and other company assets in January, 2008. Systemax operated CompUSA retail stores in California, Florida, Texas, Maryland, Georgia, Illinois, Delaware, New Jersey, North Carolina, and Puerto Rico, as well as CompUSA.com, a retail website and a dedicated catalog site for businesses. On November 2, 2012, Systemax announced that it would drop both the CompUSA and Circuit City storefront brands, consolidating their businesses under the TigerDirect brand. On December 4, 2013 CompUSA intellectual properties were sold to JASALI 645 Realty LLC. On October 25, 2018 the intellectual properties of CompUSA was leased to DealCentral, and has announced to relaunch CompUSA.com in that same day. Founded in 1984 as Soft Warehouse in Addison, Texas, a northern suburb of Dallas, Texas, by Errol Jacobson and Mike Henochowicz, the company began national expansion in 1988 with its first megastore opening in Atlanta, Georgia. In 1991 the company's name was changed to CompUSA, and the company became publicly traded on the New York Stock Exchange. While under Nathan P. Morton's leadership, CompUSA grew to over $2 billion in revenues. Morton resigned in 1993. 1990 – Long running radio ad campaign featuring character "P.C. Modem" begins. 1993 – Began offering technical services at customer locations. 1996 – Launched retail sales on CompUSA.com. 1997 – Partners with Apple Computer in a "store within a store" concept for selling Macintosh computers. By January 19, 1998, 57 stores had been built with the remainder to be built by February 1998. 1998 – Acquired Tandy's Computer City subsidiary with the help of former CEO Nathan P. Morton. 1998 – In May, the company invested in facilities, technology, and expertise to form CompUSA Call Center Services, a division that provided contact center services to OEMs, corporate help desks, software publishers, and cellular service providers. 2000 – Became privately held company under Grupo Sanborns, a Mexican retail company. 2001 – In July, CompUSA Call Center Services became The Telvista Company. 2003 – Acquired Good Guys. 2005 – Converted three CompUSA stores and 13 Good Guys stores into megastores. Closed all 46 Good Guys locations. Began marketing in California and Hawaii as "CompUSA with Good Guys Inside" in response to Best Buy's marketing campaign "with Magnolia Inside". 2005 – CompUSA started a customer loyalty program called The CompUSA Network. For every dollar spent at any CompUSA store, the customer received 13 points. 2006 – CompUSA announced the end of the Network Reward program. All customers were issued coupons for the remaining reward value. They were also offered a refund of the original purchase price in the original form of payment, surrendering remaining points. 2006 – Announced the closing of 15 stores across the United States including several locations in California. These stores were being used to liquidate discontinued items from other stores across the nation until the end of October. Roman Ross, a former Philip Morris executive, replaced Tony Weiss as president and CEO after only four months in office. In November, CompUSA launched their new "Home Entertainment" rollout in 40 of its stores, including Puerto Rico, that sold a variety of high definition televisions and home theater equipment. Ross claimed that home entertainment was one of his chief focuses as the new CEO. In September, it was reported that CompUSA's Mexican parent, Grupo Carso, was interested in putting CompUSA up for sale. 2007 – The company announced the closing and liquidation of 126 stores due to the "need to close and sell stores with low performance or non strategic, old store layouts and locations faced with market saturation," according to CEO Roman Ross. The realignment included a $440 million cash infusion, store closures, major expense reductions, and a corporate restructuring. 2007 – On May 14, CompUSA finalizes the first round of store closures as liquidation sales end. 2007 – On December 7, CompUSA was acquired by Specialty Equity, an affiliate of Gordon Brothers Group, as discussions led to the agreement on store sales and closeouts for the remaining 103 stores. 2008 – On January 6, Systemax Inc. announced an agreement on the acquisition of the CompUSA brand, trademarks, e-commerce business, and as many as 16 CompUSA retail outlets in Florida, Texas, and Puerto Rico. 2008 – On March 2, CompUSA finalizes the round of store closures that started on Dec 7. AT&T Consumer Home Services agrees in principle to purchase the TechPro group for an unstated amount. 2008 – On March 21, CompUSA announces that 12 CompUSA stores are open to the public. 2008 – On October 1, CompUSA announces a new strategy called 'Retail 2.0' which integrates Internet shopping convenience throughout retail stores. Concept store debuts to public at Dadeland Miami, Florida location. On or immediately before February 28, 2007, CompUSA retained the services of Gordon Brothers, a company that specializes in asset recovery and restructuring, for the purposes of closing 126 stores nationwide. The closing locations were chosen based upon their overall performance, profitability, and proximity to competitors such as Best Buy, Fry's Electronics, Micro Center, and Circuit City. This first round of closings reduced the number of stores to less than half of its previous number. During the liquidation process, the stores typically offered discounts starting at 5 to 30 percent off of retail prices, ending at up to 95 percent. Liquidation was completed on May 14, 2007. On December 7, 2007, CompUSA was sold to Specialty Equity, an affiliate of Gordon Brothers Group. On January 6, 2008, a month after CompUSA was sold to liquidators, Systemax, Inc. (TigerDirect's then-parent company) announced its purchase of 16 CompUSA locations as well as the brand, trademarks, e-commerce business, and technical services. Systemax also had announced that the eleven existing and three TigerDirect-branded retail stores that were under construction would be converted to the CompUSA brand over the spring of 2008. On November 2, 2012, it was announced that Systemax would drop both the CompUSA and Circuit City storefront brands by consolidating their businesses under the TigerDirect brand and website. That officially marked the end of the heritage CompUSA brand name as used by Systemax. Customers of both businesses were informed via e-mail on November 7, 2012. ^ "About CompUSA.com, Inc. Archived 2010-01-06 at the Wayback Machine" CompUSA. Retrieved on January 7, 2010. ^ "Wright Reports Company Profile - US Commercial Corp SAB De CV". wrightreports.ecnext.com. Retrieved 2007-12-28. ^ Miguel Bustillo (March 22, 2010). "Systemax Gives New Life to Failed Brands". The Wall Street Journal. New York: Dow Jones. ISSN 0099-9660. Retrieved October 21, 2011. ^ "CompUSA Retail 2.0 Store Updates". www.retail20.com. Archived from the original on 2009-04-19. ^ Halkias, Maria (February 5, 2008). "CompUSA couldn't overcome obsolete practices". The Dallas Morning News. Archived from the original on February 8, 2008. ^ "History of CompUSA, Inc. – FundingUniverse". www.fundinguniverse.com. Retrieved 2016-07-19. ^ "Telvista's History". telvista.com. Archived from the original on 2007-12-21. Retrieved 2008-01-20. ^ CompUSA To Buy Good Guys. About.com. 2003-09-29. ^ Laura Heller (September 5, 2006). "CompUSA names new CEO". DSN Retailing Today. Archived from the original on June 4, 2012. Retrieved October 21, 2011. ^ CompUSA seeking buyer, paper says Archived 2007-02-23 at the Wayback Machine. CNN Money. 2006-09-13. ^ "CompUSA Announces Realignment Strategy" (Press release). CompUSA. 2007-02-27. ^ CompUSA Store Closings. C-Net. Retrieved 2007-12-14. ^ "Systemax Announces Definitive Agreement to Acquire Selected Assets and Retail Stores From CompUSA". RedOrbit.com. 2008-01-06. Retrieved 2008-01-06. ^ "CompUSA News: 12 Stores Already Open" (Press release). CompUSA. 2008-03-21. Archived from the original on 2008-05-17. Retrieved 2008-03-23. ^ Ganapati, Priya (April 9, 2009). "CompUSA Comes Back from the Dead". Wired. Retrieved 2009-06-28. ^ "Closing Stores". CompUSA. Archived from the original on 2016-03-03. Retrieved 2007-12-26. ^ "CompUSA sold to Boston-based firm". Honolulu Star Bulletin. 8 December 2007. Retrieved 2007-12-14. ^ "Plano CompUSA store to re-open". Dallas News. 12 February 2008. Retrieved 2008-02-27. "Retail 2.0 - A new Retailing Concept by CompUSA"